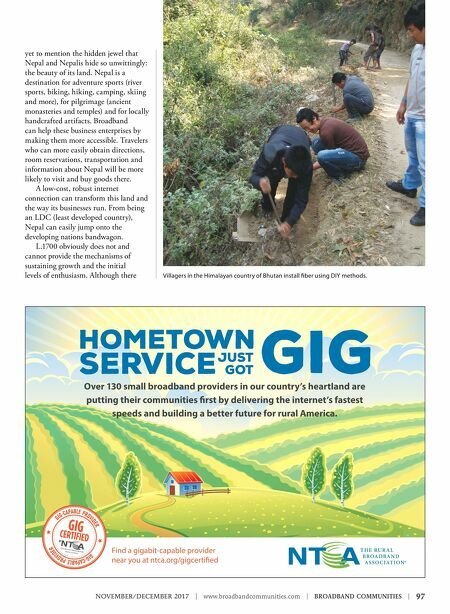 NOVEMBER/DECEMBER 2017 | www.broadbandcommunities.com | BROADBAND COMMUNITIES | 97 yet to mention the hidden jewel that Nepal and Nepalis hide so unwittingly: the beauty of its land. Nepal is a destination for adventure sports (river sports, biking, hiking, camping, skiing and more), for pilgrimage (ancient monasteries and temples) and for locally handcrafted artifacts. 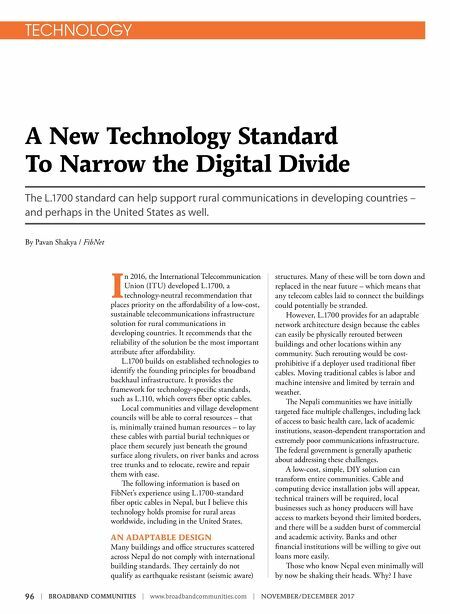 Broadband can help these business enterprises by making them more accessible. Travelers who can more easily obtain directions, room reservations, transportation and information about Nepal will be more likely to visit and buy goods there. A low-cost, robust internet connection can transform this land and the way its businesses run. From being an LDC (least developed country), Nepal can easily jump onto the developing nations bandwagon. L.1700 obviously does not and cannot provide the mechanisms of sustaining growth and the initial levels of enthusiasm. Although there Villagers in the Himalayan country of Bhutan install fiber using DIY methods.